South Australian Police at work during this year's Operation Austrans. The annual national compliance blitz, Operation Austrans, is on again with state police already busy after 24 hours. 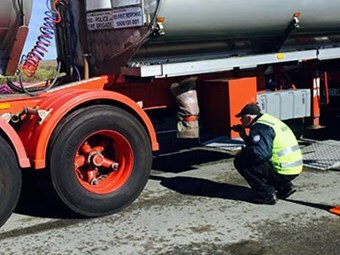 Operation Austrans will target fatigue, speeding, drug use and other driver behaviour issues within the heavy vehicle industry on major highway until June 13. Much of the early running is being done by South Australia Police (Sapol). 1 immediate loss of licence issued. Police also detected a 40-year-old Tailem Bend man who blew .152, tested positive for methamphetamine and cannabis, possessed cannabis and was driving his vehicle disqualified. A 50-year-old Western Australian man driving a B-double was detected positive for methamphetamine and cannabis and a driver of a prime mover had defective brakes. Operation Austrans runs to June 16. Traffic Support Branch Inspector Steve Kameniar says illegal activity, speeding and vehicle defects are in the sights of national police this year. Police will look to "reduce and interrupt opportunities for criminals who utilise the heavy vehicle industry". "National research shows that heavy trucks and buses make up only three per cent of the vehicles on our roads, but are involved in 18 per cent of all road fatalities and over 200 deaths each year. "During the 12 months to the end of September 2014, 213 people died from 192 fatal crashes involving heavy trucks or buses," Kameniar says. "We can't have a situation where drivers and their employers are sacrificing public safety for economic deadlines. We have no sympathy for that as an excuse. "Fortunately, most drivers and employers are doing the right thing. "Operation Austrans is about letting the others know that they are also responsible for road safety. "Police will be on the lookout for fatigued drivers and will take action to prevent those suspected of suffering fatigue from endangering themselves and other road users. "We remind all drivers that the only way to combat fatigue is to stop and sleep or, better still, arrange work priorities around proper rest periods. "There is no quick fix for fatigue; using drugs makes the situation more dangerous as drugs interfere with skills vital for safe driving, including perception, judgement and coordination. "You need all your senses out there on every drive on our very busy roads. The number of new registrations of heavy vehicles is increasing, along with the number of other vehicles." He notes that between 2009 and 2014, registrations of light rigid trucks increased nationally by 22.5 per cent, heavy rigid trucks six per cent and buses 11.5 per cent. By comparison, vehicles registered overall across Australia increased 12.5 per cent in 2014. Wayne Buckerfield, the general manager investment services at the SA Department of Planning, Transport and Infrastructure (DPTI), says his department will be working closely with police. "Our regulatory compliance officers, in conjunction with the National Heavy Vehicle Regulator, will be undertaking compliance operations within the heavy vehicle transport industry. The operation will focus on compliance with the Heavy Vehicle National Law and other relevant road safety legislation, holding all "Responsible Persons" accountable for their actions / inactions in line with the Chain of Responsibility requirements. "This operation will be a concentrated effort with DPTI officers working closely with Sapol, targeting fatigue, road worthiness, load restraint, dimensions and mass limits. "All of these are known contributors to heavy vehicle crashes on roads and have a demonstrated detrimental impact to road safety."